I’ve been thinking of some of the people I met along The Way. People I walked with, on and off, for weeks. And people I met only once. And it occurred to me that each person I met was a Teacher. Each, in their own way, taught me something. Even the rude people. And the arrogant people. They were a mirror – a reflection of a part of my self. If I saw rudeness or uncaring or hubris in them, it was only because I recognised those traits within my self. Each person I met had been put in my way to teach me a lesson. How right you are Bill. The day we learn nothing is a bad day. Talk about people you know or meet – and the blog the other day about intuition!! … the quote below is from a Swami I know who lives further up the NSW coast. It is leading to an invitation to join him and others in a celebration to give thanks to all your teachers; a very nice tradition to be able to be part of! and yes, it is intuition, and whatever other name or names you can attribute to it..
Ah Bill, by now you all know how “crowded” my Camino was. Walking solo, some days you choose your companions, but mostly the Camino chooses for you. Everyone I met, was an integral part of my journey. Some you met in my camino group, and I would like to share one such pilgrim with you all. There is Tristan, from Australia, 30 something, who had sold all his possessions to take a “walk-about”. We met on the train to SJPDP, however, I did not realize that until I looked at all my pictures. Tristan and I would last see each other one crisp morning on the way to Sahagun. Fast forward to El Ganso and the walk into Rabanal del Camino. I was walking injured by then, and there is a very short section, steep and stony, and I choose to walk it rather then continuing on the asphalt road. Now I no longer looked around so much, put paid attention to the stones, each step carefully placed to avoid additional damage. And there it was, on a piece of slate I read “Rejoice in the choices of others, even if that takes them away from you.” Tristan had walked here and left the message and I felt that this came at the right time, at the right place and I felt his spirit. It helped me move forward, smiling and thankful to have met him, all those days ago. Tristan and I reconnected last year via facebook through another pilgrim friend I had helped prior to Moratinos, such is the magic of the Camino. I then asked him why he had written that message. He explained that he had said goodbye to a very special Camino friend and he finally was able to rejoice and accept. It is with great fondness that I remember Tristan. I agree. Each day there’s a comment / post that is truly touching, or inspiring. By the way, thanks for joining the forum. I’m calling it the forum where you can discuss the “spirit” of the Camino. This will distinguish it from other Camino forums, which discuss the practicalities of the Camino – albergues, equipment, stages etc. 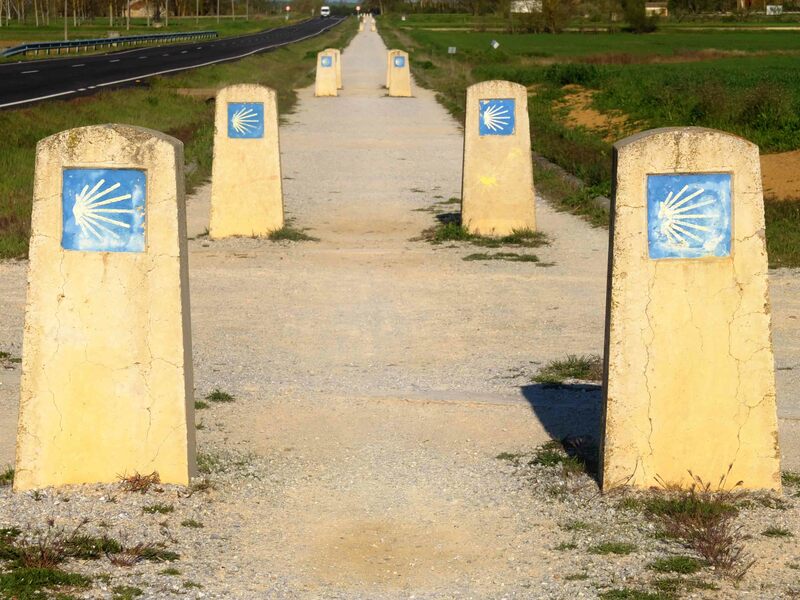 The forum will deal with the metaphysical, spiritual, religious and emotional aspects of the Camino. 🙂 yes, it has helped even post camino. I haven’t walked the Camino yet but I think this is true in our everyday lives as well. The teacher, angel, person or lesson comes when we are most in need of them/it. If we takes he time to stop, breath, and listen. Maybe on the Camino the minutiae of our daily lives is left at home and we are more receptive or even actively looking for the answers or accepting of the ideas or lessons we encounter. Have you ever met someone at just the right time to give you the information you needed to change your life and then never saw that person again? that person you describe, the person that comes along and says or does something that you need, just at the exact moment you need it, is of course an angel. My belief is that your PGS brings you to that person, to give you the guidance you need. You’re absolutely right too about the Camino, that through the reductive process of the walk, you become more attuned to these possibilities and encounters. If you go onto the forum, you can post photos!! Let me go into the admin centre and see if I can fix that. I’m still finding my way around the forum. It would be great for you to be a part of it. your account is now active. You should be able to post. Please let me know if not. Thanks for your patience, and welcome to the Forum! I have to have help with this one. I’m going to gt onto my web guru today and get this, and another few things, sorted. Thanks for the comment! You are officially a “foundation” member! What’s a foundation member? Early subscriber? Can one get the gravitar picture on that sight also like on the blog? If so, how? yes, that’s what I’m trying to figure out – hopefully I’ll have that sorted later today or overnight.